People ask me all the time about reducing Inflammation – Whether this is arthritis or from an injury or general internal discomfort and swelling, inflammation is the body’s way of dealing with stress. Inflammation is a precursor to cancer. There are several ways to remove or reduce inflammation in the body which will result in better mobility, less pain. Less cancer risk. And when it comes to your organs and gut health, better comfort and assimilation of nutrients, less gas and bloating and weight loss. Eliminate sugar – This one is difficult I know. From pasta to wine, sugar is plentiful. Cancer loves sugar. Reduce inflammation with a daily intake of Blue Green algae, chia, hemp, flax seeds as well as primrose oil and fizner oil. Copper water aids in balancing the 3 doshas, Kapha, Vata and Pitta, reduces inflammation, respiratory disorders, spleen, and gynecological disorders, skin diseases and get rid of piles (Hemorrhoids). An easy way to add copper is by placing purified water into a copper pitcher and leaving it overnight. Copper also helps with premature graying of hair by drinking water treated this way. Turmeric reduces tumor cell growth, minimizes inflammation in the body. Let’s talk about Superfoods. I sell this stuff. I’m a brand partner for two organic companies who are eco and animal-friendly. Before I sign on with anyone, I fully vet them, their ingredients, (are they organic or wildcrafted) how they process their product, (is there heat applied that would denature the product) and how often are batches made (has it been sitting on a shelf a decade already). Folks, if you are buying non-organic, you are ingesting pesticide and GMO plants. You are worth getting the best. And my slogan is ‘If what you work at harms people, animals or the planet, it’s not worth any efforts or any amount of money.’ I came up with this in thinking about a friend I had turned onto my plant-based products to earn extra income and she immediately signed up with Mary Kay (toxic). I can only assume to make more money but while money is terrific, I LOVE shopping and feathering my MCM home and I also love fast cars too…it is not worth losing your soul over. When we think about our genetics, do you realize that only 10% is you and the other 90% is all the microbiota that you are a host for? Yes, our gut is a living (or should be) world for good bugs, the microbiome. Good plant-based, cold processed, certified organic, supplements made with care are not going to be cheap but they are so worth it. If you’re used to buying non-organic mass-produced synthetic crap this stuff is on an entirely different level of quality. 95% of supplements on the market are bad for you, contain fillers, are synthetic rather than plant-based. 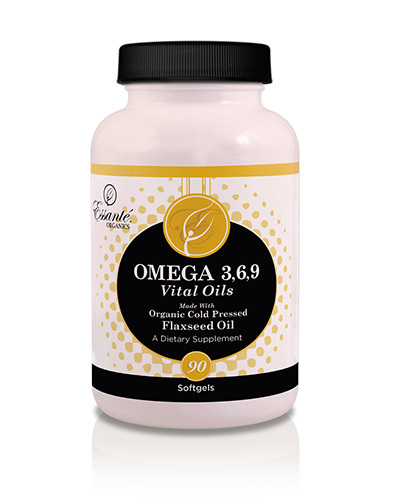 If you are taking fish oils for your omegas, know that fish get that from plants, from sea algae. And all fish is toxic these days, with mercury and plastics and pharmaceutical drugs. There was a recent report on pets getting sick as pet parents have gotten on the bandwagon of giving their dogs omegas. Skip the fish oil. Bad supplements do nothing but cause harm and are cheap to make. You’re going to pay for quality. On the upside, there are volume discounts and free shipping with this great product! Look in your shopping cart as you add items and you will see when you hit certain levels the discount increases. Back to superfoods and why we all need this! If we still lived in the 40s, the soils would be plentiful with minerals, the plants organic and vine-ripened, bought only in season and filled with far more nutrition. A can of spinach then requires now about 15 cans to equal the iron and other minerals….to give you an idea. And, a head of lettuce loses 50% of its nutrition within the first 30 minutes of being cut. Imagine what the nutrition is once it travels on the trucks and finally makes it to the supermarket, then to your car and lastly into your fridge. Do you eat it right away or does it take you a week or longer to finally eat all the lettuce you bought…or other fruits and veggies? What do superfoods do for you? PROBIOTIC- First, you need your gut bugs and to feed them properly too. The InLiven Superfood, based on more than 20 years of research, contains the complete Lactobacillus family of 13 strains combined with 26 certified organic whole foods naturally fermented for 3 weeks prior to bottling. A healthy intestinal tract should contain at least 85% ‘friendly’ bacteria to prevent over-colonization of disease-causing microorganisms which result in a large number of ailments from digestive disorders and painful joint inflammation to susceptibility to colds and flu.SUPER REDs – BerryRadical is a dark chocolate cacao delicious combination of nine of the world’s most potent, antioxidant, superfoods. I use it as hot cocoa (with a bit of stevia or organic Xylitol) or put in a smoothie. What I love are no sugar type fillers. This tasty, high potency formulation gives you the antioxidant of equivalent eight servings of fruit and vegetables in every teaspoon. SUPER GREENS – Keeping the correct pH balance in our bodies is vital for ongoing good health. Failing to keep that balance can result in loss of minerals that results in reduced bone density associated with osteoporosis. A body which is too acidic has been linked to other conditions including atherosclerosis, kidney and gallbladder stones and arthritis. As with the Super Reds, there are no sugary fillers. Coming from my Hippocrates training, I also love that wheat grass and spirulina and chlorella are included. I like to add a scoop to my salad daily. You can save money by purchasing the Vitality tri-pack. No, not cheap but you will see/feel a difference. I also recommend slow yoga and massage and really like the Himalayan Botanique brand muscle & joint rub. Epsom salt or Mustard baths also help. And don’t forget to be thankful to your body, for getting you through life thus far. Honor it by the best nutrition, eliminating (or reducing) processed foods, carbs/sugars. Dairy is a huge inflammation producer. So anyone doing dairy should eliminate or go organic and drastically reduce. Casein is in all dairy and is a carcinogen. The more stressed out the cow (factory farm, just lost her baby so we could drink her milk = one very upset mama) the more casein we ingest not to mention there’s puss in it….because we are not taking care of the mama, she is just a milk machine to the farmer…it’s a sick and cruel industry. And it isn’t healthy for us either. From meal replacement shakes (like Salted Caramel and Chocolate Kiss) to probiotics (Ph Lora), Super Reds and Earths Greens. What I like about these products is the capsule for the Earths Greens, great on the go, a high ORAC value equivalent to 5 1/2 lbs of veggies that is a fantastic product sans the algae that some folks cannot do. The probiotic has a patent on it and the Super Reds is a fruity blend with a bit of stevia in it that doesn’t have a nasty aftertaste…because in general, I am NOT a stevia fan…so this is great in a bit of water on ice as well as in a smoothie. It’s a common occurrence in our too fast-paced lives that most of us lead, to feel a bit edgy or ‘stressy‘ on occasion. But when you find yourself feeling this way daily and perhaps without even knowing why can be diet or nutrition related. Lifestyle is so important. How we live, combined with how we take care of ourselves adds up to a longer life with more vitality in it. Firstly, no matter how cleanly you eat, we all need some kind of supplementation. Since 85% of the supplements out to market are bad and bad for you, it’s important to read labels, align yourself with folks you trust (me) listen to your body, honor your feelings and give yourself the necessary support. Not doing so ages you faster as it reduces your current life quality. I have a very enlightened MIL (Mother In Law). My SIL (Sister In Law) is pretty groovy too. Visiting my MIL a few months back, she was very on edge and commented that she didn’t really know why, was just chalking it up to age. I asked her if she was perhaps taking any magnesium because she was upset, felt very on edge and yet there wasn’t a logical cause to her upset. I began talking about Natural Vitality Calm and ran down to the guest room to get her one. Turns out she was familiar with them, had taken them in the past and just, like I think we all do, got off track, forgot about them and found herself in need, out of balance. Sort of like that Snickers commercial where you aren’t feeling like yourself? But rather than reach for sugar, which is ultimately very bad for you, supplement with vitality. This powder, which comes in a jar and on the go packets, works great. Magnesium is important for supporting calcium in the body. Great for sleep or relaxation, it can be the ally you need when working on a stressful project, or perhaps if you don’t have an enlightened MIL. 🙂 Healthy levels of Magnesium support your immune system and bones as well as blood pressure and sugar levels. You can be low on Magnesium because of strenuous work out, stress, taking cortisone (please avoid, this is NOT a good thing to do for your body go get acupuncture instead) too much calcium (which can also cause stones) as well as GI disorders. This brand is cruelty-free, Vegan, Organic, All Natural, Non-GMO, and Gluten Free. Another great support system to implement into your lifestyle is superfoods. I market 2 kinds; one that has seaweed/algae and one that doesn’t. I have a couple of clients who don’t want to do sea veggies so both are great options for resilient health. Now, I get folks who tell me they are just looking for a green drink, something to alkalize. But I believe in the trifecta approach to wellness because when the body is fed, the mind is eased and we are less stressed more balanced. This pack, Miessence Vitality Pack!, Provides you with a full on 30-day support system. When purchased as a pack, the cost is reduced plus you can get up to a 40% discount based upon your spend so there’s always an opportunity to save. I like to mix the trio into a smoothie on smoothie days. To warm up, I enjoy mixing the Red into a delicious vegan hot cocoa with water, a bit of stevia and nut milk. All can go well into a juice or water. The Deep Greens is delicious mixed in with dressing for salad. The combined alkalizing, probiotic, and antioxidant nutrients in the Vitality Pack are a concentrated source of super nutrition that offer major benefits to your entire body. 80% of our immunity is in our gut. And if our gut isn’t right, our mood is not going to be either. In-Liven – Contains 26 naturally fermented organic whole foods to help recolonize the gut with beneficial bacteria. Fermented foods are one of the keys to longevity. Berry Radical – anti-aging from the inside! Our skin is the outer layer which should always be protected. Adding a chemical free moisturizer is a great way to shield against free-radical damage and pollution. But this gives you beautiful skin from the inside! The antioxidant equivalent of over 8 servings of fruits and veggies in one delicious beverage. DeepGreen – balance your body pH with a super-concentrated source of alkalizing, mineral-rich, green algae, grass juices and leafy greens. Minerals are so important and most folks are deficient in them. As we age or over whiten our teeth, we can have issues where the teeth crumble and weaken. This is why. Essante offers land based superfoods for anyone who is sensitive to water veggies. Both Earth Greens and the fruity Super Reds are a 3 month supply and 5.5 lbs. of organic, whole food nutrition per serving! There’s also a daily digestive and patented probiotic. I am also a HUGE fan of yoga. Yoga is one exercise that is truly a practice that marries the mind, the spirit and the body for a very calming introspective work out as you take a spiritual journey too. FULL DISCLOSURE: As a Plant-based coach, passionate about saving the planet, saving the animals and saving us, I have aligned myself with Amazon because they sell most anything. I think you can buy a soul on Amazon, really. So this way I can provide you easy links to get more information or purchase if you like. I am also a brand partner for eco-friendly, carbon Neutral organic products that I use myself. I fully vet everything I discuss to bring us all closer to limiting toxins in our environment and aiding our bodies in their attempts to daily detox and release the body burden we all have. I welcome comments! If you have found something that helped you out, kindly share my blog and report back to help others. Eating a healthy, predominately raw plant-based diet is the big step forward in anyone’s health. Today I want to discuss a few of my favorite superfoods. All of us need supplementation and with 95% of the supplements on the market being toxic or a waste of money, I strive as a vegan lifestyle coach, organic skincare Independent Consultant and affiliate marketer, to basically do the research and shop all day, reading ingredients, where things are sourced, then who has the best ‘deal’ on both quality and price (value) and write about it here. Here are my rules: 1) Plant-based – The supplement must be plant-based and contain no synthetic ingredients because I believe the body, at a cellular level, doesn’t adequately absorb them or see them as food. What you want are the full spectrum nutrients you would get if you were eating optimally. Seeing NOS which is Naturally Occurring Standard certified, on the label lets you know the product is not synthetic. 2) Organic (or wildcrafted) – The supplement must be organic so I look for certification there. The reason is that generally the quality of the supplement is going to be better, more nutritious and being organic lets me know it is non-GMO and that no pesticides were used. 3) Vegan – Both the product itself and whatever the softgel or capsule is made from should not be animal based. 4) Quality Control – How is the product sourced and how is it made, what is the process, or facility the supplement is made in because this matters to assure contaminates are minimized. 5) Value – I price check and ingredient check to come up with what I believe to be the best deal. Spirulina or Klamath Lake Blue-Green Algae – Known to purge the body of heavy metals such as mercury, this plant is knowns as the best nutrition in the ocean, spirulina contains zinc, manganese, selenium, copper. We could live abundantly on just this plant and water. Spirulina has 58x more iron than spinach, enables the body to repair DNA and protein levels are 400x more than beef. Here we want the Klamath Lake spirulina as this algae is the purest form. Moringa – Containing all 8 amino acids, one tablespoon is equal to 2 cups of greens. Protein, calcium, iron and fiber are all great things in this nutrient-dense plant powder. Great for post-workout inflammation and overall detox. Chlorella – Chlorella is a sea plant or seaweed. It is a powerhouse of b12, biotin, vitamin a and is known for taking heavy metals and radiation out of the body. This supplement is what I reached out to Naoto Matsumura and recommended a few years ago. Naoto is the man who during Fukoshima fled with the rest then later returned to his hometown of Tomioka where he remained to take care of all the pets left behind. Spirulina or Klamath Lake Blue-Green Algae –I like Pure Synergy Organics as it is cold processed and stored in a glass bottle. You can do powder however, it tends to clump unless mixed well into a smoothie. I recommend the capsules, taken throughout the day and getting the powder in a blend for smoothies and salads. Blends – Miessence Deep Green, which is a synergistic combination of Chlorella, Spirulina, Wheat and Barley grasses amongst others. I am an Independent Rep for this brand because the entire line is clean and certified organic. Their skincare is edible too! Moringa – Moringa Source raw organic Moringa is a good value with 16oz for $15.99. Kuli Kuli Organic Pure Moringa Vegetable Powder is 10oz for $24.35 which is higher but I chose this one as the company states that they source the plants in a sustainable way, utilizing growers in a network of farms across the globe. I want the rainforests to be happy. Chlorella – Anthony’s organic Chlorella powder is the best price but does not say where the Chlorella is sourced. $13.00 nets you 8 oz. I believe the bareoganics Chlorella is the best value, however, because the company assures that the product is raw (not heated where it would lose enzymes and vitamins) and is grown in stainless steel tanks to protect the chlorella from toxic substances and also assure a better flavor. 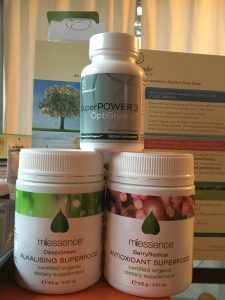 Blends – If you are looking for a great blend of superfoods, I highly recommend Miessence Deep Green, which is a synergistic combination of Chlorella, Spirulina, Wheat and Barley grasses amongst others. I am an Independent Rep for this brand because the entire line is clean and certified organic. Their skincare is edible too! For those with allergies to Seaweeds or algae or wish to augment with other superfood combinations, another great blend of superfoods, I highly recommend is Essante Earth Greens which is a mix of Barley and Wheat, Kamut grasses, lemongrass, kale, amongst others and does not contain spirulina or chlorella. I take all of these things in a rotation and do both the powder and the capsules, which are easy to do traveling or on the go. Because all of their products are wildcrafted or organically grown, I am an Independent Consultant for Essante as well. I appreciate feedback and encourage you to report back on what you are using and how it has helped you. www.EssanteOrganics.com/Puretemple Where ingredients are plant-based, certified organic and wild-crafted. Many folks, as I once believed, think eating sushi and fish in general, to be a healthy thing. My vet keeps trying to cajole me into providing fish oil to my dog, for the omegas and joint lubrication. As a plant-based lifestyle coach, I seek out and market green, pure, eco and animal-friendly companies because Jesus Palomino there is a ton of crud out there to choose from and I know we can our omegas in other far healthier (and kinder) ways. While we need Omega 3s, there are a few compelling reasons to leave fish off your list. First, we have polluted the waters. All fish now contain plastics, pharmaceutical drugs, mercury and other harmful contaminants. Farmed fish is no better with the over-crowding and GMO laden feed pumped with antibiotics to keep these stressed and crowded fish alive. Lipid Peroxide is the oxidative degradation of lipids, causing damage to the cell membrane because free radicals steal electrons from the lipids in cell membranes. Fish oils exposed to air become a poison. The fish lobbyists want to sell you omega 3 but it’s toxic. When fish die out of the water, the oxygen immediately makes the oils rancid. Fish do not stink when alive, but immediatly after begin the ‘fishy’ smell. I keep fish and know it well. The body is designed to produce essential nutrients like EPA and DHA from whole foods. Next, we have over-consumed them. There are other fish, whales, seals and polar bears starving and not just due to the dwindling sea ice, but because we have overfished the oceans that were once a plentiful bounty. Fishing is no longer ethical, using crawlers that catch so many fish at one time with dire bycatch consequences. Greed has corrupted us, and overpopulation, attempting to meet supply with demand has done such an insult to the earth. And lastly, fish are sentient beings with their own feelings, likes and dislikes, they think and they feel especially the higher up you go. For example, fish don’t need calculators, but I do. Just a joke. No, I really do need a calculator, and a notepad to write everything down. Here are some ways you can get your Omega 3’s: Chia Seeds and their sprouts, Hemp Seed and oil, Raspberry seed oil, Flax seed meal and oil, pumpkin seed and oil, primrose oil, walnuts and oil, Fizner Oil, green veggies, most sprouts, green and blue-green algae. I take Klammath Lake Blue-Green algae not just for this reason, but as a full-on detoxer. Pure Synergy Blue-Green Algae is a good source. What I like about Essante, and why I am an independent rep for them, is that this company really focuses on pure ingredients. 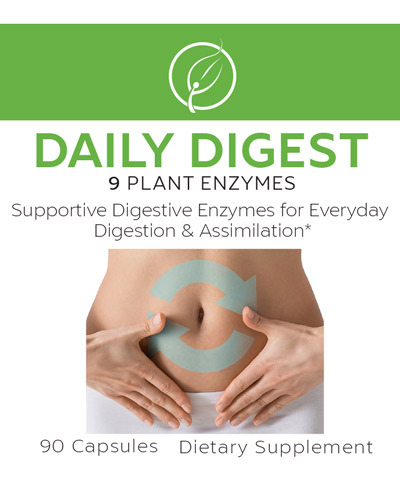 They have just launched a patented probiotic guaranteed to grow in the gut (the only probiotic guaranteed to do that) and they have great superfoods (Reds, greens) and digestive enzymes which are necessary when eating cooked foods and beneficial for anyone including those on a raw diet. The more you stress your body, the faster you age. Give it help. I have vegan friends who shun all supplements. At Hippocrates, I confirmed my feelings that in this polluted world, no matter how we eat, we do need some supplements. Choosing smartly is the key. The more our world is corrupted, the more we need help and mindfulness. Essante’s Omega (3,5&9) is organic flax seed. This is cold pressed, unrefined. This means you are getting quality ingredients that are not adulterated by GMOs (Genetically Modified Organisms) or any pesticides. When doing your own comparison, note that the bottle is 90 capsules and the suggested dose is 3 times per day. Clicking on the link above, selecting PH Nutrition, Supplements and Powders, will get you a lot more detail but for those who care about this (I do) the capsules are gelatin. The company is slowly going vegan with their capsules and as I type this, that may have changed by the time you order. Still, something to be aware of. You can always poke a needle through and squeeze the goodness out onto a salad etc. Each soft gel has 1g of healthy vital fat. There is no heat in the processing and no metals. It may surprise you but there is Mercury in our shots when we go to the doctor and also in a lot of our supplements. None here my friends! No preservatives, no funk. No junk no funk. This is a US made product, not outsourced to Asia where regulation stinks and you get sub par quality. (See my blog about Canine Kidney). Like the next omega I will show you, Essante is also 3rd party certified. This means they are woke enough to make something of value and prove this by engaging a 3rd party to confirm the quality. Natures Way is also a great brand. This omega uses algae and not flax seed. I love that the capsule is vegan, they are 3rd party tested and that it’s a plant based omega. The price is great too. That stated it is not organic as Essante is and does not confirm exactly how it is processed so I cannot confirm it is cold pressed which is important for retaining value in the product. My thinking here is that if it were cold pressed, that would be shouted to the moon and back. So….you get what you pay for, but this is a decent product. 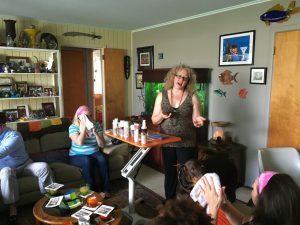 This is me teaching a class on organic skincare and walking everyone through a yummy facial. Our AIR, SOIL and WATER are horribly polluted, as are the creatures that inhabit them. One of the reasons to go vegan is because eating animal fats, where toxins are stored, causes you additional harm. Plants don’t store toxins the same way animals do. So in short, the higher you eat on the food chain, the more damage you will have. Most of us, on some level, realize that what we eat, what we put in our bodies, is going to have an effect on us, but so many people don’t think about the toxins in their skincare routines. Because the body absorbs at least 70% of what is applied, it stands to reason we want to be very mindful of the chemicals in our lotions and potions. From Avon to Clinique, Borghese to Aveda, no matter where you shop, it is very challenging to find a line that is 100% clean, let alone one product that is. A simple word like ‘fragrance’ can mean an entire chemical laden stew that disrupts your hormones, your endocrine system and includes carcinogenic substances. Seeing all these chemicals and their effects on us, animals and the planet are what motivates me to market and evangelize on safer skincare. Essante – Essante has a great eye cream and firming skincare treatment as well as superfoods. This line is a mix of certified organic and wildcrafted. The line has clean and effective skincare products, I love their Rejuvenate which helps with hyperpigmentation and sun spots, their NAPCA spray which goes from hair (de-frizzing) to toes to moisturize. The NAPCA spray creates a nice set up to layer the Body Butter on if you have dry skin. For cosmetics, there’s a clean mascara and eyeliner and their lipgloss tastes like lemonade. I love their lipglosses. The sanitizer spray goes from the locker room to kitchen countertops to wounds, with stabilized oxygen killing off bacteria. MIESSENCE – So clean you can eat it. 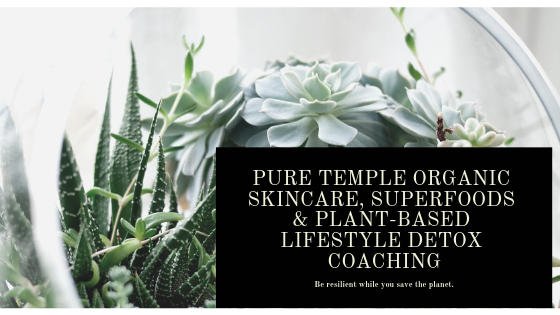 100% plant-based skin and body care with a few home care products and fantastic superfoods. This line offers a wide selection of skin and body care and home care products. They are based out of Australia but ship swiftly. Detoxing your makeup bag & routine – The average person puts on between 120 and 200 toxins before 9am. These are hormone disrupters, carcinogens, that your body has taken in perhaps before your first cup of coffee or tea. It is important to read your labels, know your products and what’s in them that you are applying. PEG – Polyethylene Glycol, Ethylene Glycol Propylene Glycol – This chemical poison is in anti-Freeze and yet it is also in so many foodstuffs as well as cosmetics. It is even in some pet foods and treats and, recently, in some wet wipes, I bought for my cat that I had to toss out because um, cats lick their fur so why on earth would such a toxic substance be in a wipe for a cat that is known for grooming? Really, I am absolutely amazed at how many items this toxin is in. It is used in cosmetics as it is easily absorbed into the skin, so it assists other ingredients in a deeper dive, but the cost can be damage to the liver, kidneys or your brain. Triclosan – I ended up with this actually in an organic hand cream I ordered which did not provide me with the full ingredient list until I received the cream. Triclosan, used as an antibacterial, accumulates in our bodies, is a hormone disruptor and can help create bacteria that is resistant to antibiotics. Formaldehyde – From detergents to hair conditioners to mouthwashes, Formaldehyde is classified as a Category 2 Carcinogen. Parabens – Used as a preservative, it is a hormone disrupter shown to be a reproductive toxin in animal studies (hint…We are animals). Parabens have been detected in breast cancer tumors. Nanoparticles – Cosmetics have come a long way. In the past, a lot of our makeups used to just sit on top of the skin. But nanoparticles are very tiny. If the nanoparticle is zinc oxide or aluminum, due to such a small size, it can literally get into your body and end up going from an eyeshadow or foundation or sunscreen to penetrating into your organs. Diethanolamine (DEA), Triethanolamine (TEA), e.g. Cocamide Monoethanolamine (MEA) Oleth-3, Phosphate, Tea-Lauryl Sulfate – NDELA – Nitrosamines have been identified as one of the most potent classes of carcinogens, having caused cancer (liver, stomach, bladder and esophagus) in more than 40 different animal species, including us humans. These chemicals are reactive toward other ingredients in the product, making a volatile toxic stew. And for those of you who are passionate about health, learning and taking the natural, alternative path, I welcome you to go down the rabbit hole that inspired me to become a plant-based lifestyle consultant and write this blog and consider studies with Hippocrates Health Institute. You can click on the link below to get your free syllabus. The course is not inexpensive, but I assure you it will be chocked full of information you didn’t already know (I thought I would know it all but I didn’t) and it will be life-changing. Everybody has their opinion on this topic but I believe in supplementation. Even if you are eating 100% raw, grow most of your own food, sprout sprouts and down 4 cups a day of them, and green juice daily – everything organic – doing everything right – we have polluted air, soil and water, soil erosion, produce that sits on trucks and loses potency by the time you eat it. Depending upon the organic soil used, the grower may care about truly supplementing the soil or not so much so the product is going to be varied. People are People. You have the all in folks, who do everything to build their health and never vary or cheat from what they know is the very best, the folks that power vegan on week-ends and the junk food vegans, folks who are way too busy to step back, buy a great juicer (see my website/blog) and juice every day when there is work and family concerns. And you have the folks not yet ready to give up meat eating but perhaps want to be healthier or kinder to animals and the planet so they work on that issues one plate at a time. It takes more time and thought to eat correctly and it takes a huge mind shift. This is significantly daunting at first. Like anything we do, it does become habit and it does get easier. I promise you! My favorite story from when I first went vegan was trying to fix something at home for my executive chef husband that didn’t have meat or dairy in it. He took one look at the kitchen island and said ‘Well, you got me (gesturing to the plethora of foodstuffs on the counter) I have zero clues as to what we are having for dinner.’ I had a really rough time at this. Eating vegan and healthy can certainly be done with diligence, but throw in travel, then it really gets complicated. This is WHY I rep for 3 product lines and when I locate a great cookbook, or a way to grow sprouts easier, I post about it. www.bioceutica.com/puretemple – Bioceutica has superfood capsules with great greens in it. All you do is pop two capsules and *boom* done for the day. This has great stuff in it, such as Resveratrol, from red grape skins, shown to be highly anti-aging, Spirulina, ginger and turmeric. This is easy peasy to travel with. There’s no muss or fuss with carrying around powders to mix into something. www.EssanteOrganics.com/Puretemple – Offers a combo pack for $97.00 or you pay $50.00 for either their Earth Greens or $47.00 for Super Reds powders. They also offer capsules specifically for the Earths Greens where you get 270 capsules per bottle for $72.54 which is 90 servings. This line is a mix of both certified organic and wild crafted produce. Miessence: For $75.95 you can purchase their Probiotic, Alkalising or Antioxidant powders. These are their superfoods and they are excellent. All 3 may be purchased for $204.95. Micessence also does periodically offer a 30% off or, if your spend level is high enough they give you that. Either power is 105g of product, about 30 days. Essante : Offers a combo pack for $97.00 or you pay $50.00 for either their Earth Greens or $47.00 for Super Reds powders. They also offer capsules. Bioceutica – Offers SuperPower3 in capsule form, $40.95. While there is no wheatgrass, there is spirulina, resveratrol from grapes, kelp, numerous botanicals and this would be a great on the go supplement if you are not inclined to make juices and smoothies or on days that you don’t, such as when traveling perhaps. Miessence is 100% certified in their Super Foods and the green alkalizing food contains Chlorella and Spirulina and Wheatgrass, ALL HUGE with Hippocrates Health Institute where I took training. Essante powders are a mix of both organic and wild crafted non GMO. You get a lot more product, 200g and for less. From my perspective, Miessence is a better superfood offering in quality. But, some folks will want the savings and more product that is still a great product with Essante. Or, speaking personally for what I do, I get the Miessence organics superfoods in powder form. I scoop the Deep Green onto my raw salads and mix it into my salad and dressing and its delicious. For the Berry Radical, I use that like a hot cocoa, mix that into some hot water at the office and …delightful. For on the go I also use the capsules but I buy the Essante because for $72.54 I have a 90 rather than a 30 day supply. Both products are great, it depends upon what greens you want.